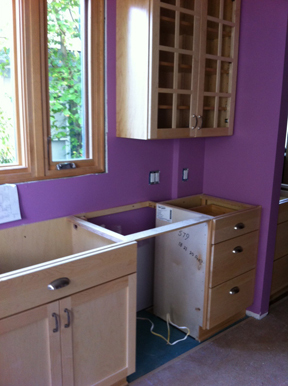 Yesterday the cabinet installers finally finished everything necessary before the countertop goes in. Good thing, since the countertop is scheduled to arrive this morning between 8 and 10:00. I thought you might like one, oops, better make that two lasts looks at the before. Last look facing south before countertops. An upper cabinet will go in right corner. 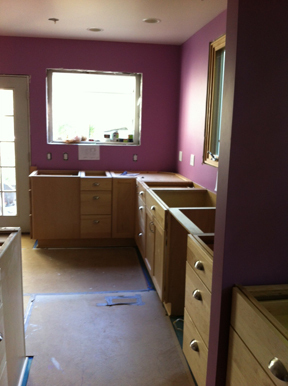 You’ll note that the cabinets and drawers have handles and pulls now. There are still upper cabinets to come on the right, but they can’t be installed yet because they rest on the countertop (because of the appliance garage). Here’s another view where the sink and dishwasher will go. Openings are for the sink and dishwasher. The next thing you see will be countertops. I am waiting for it to get here before I head to work. When I get home, the view will have changed dramatically.